I’m often laughed at for my strict self-imposed rule of visiting four countries per year. So, with one still to go in 2011, and a free First Great Western ticket to a destination of my choice, it made sense to get my money’s worth by taking a trip Cathays Park in Cardiff, Wales. Cathays Park was described in the Pevsner guide to Glamorgan as “the finest civic centre in the British Isles” (presumably followed soon afterwards by Newport Civic Centre, a wonderful Art Deco affair which I had the good fortune to see from afar on an unfortunate stop en route to Wales when my train was severely delayed). In 1897, the architectural firm of Lanchester, Stewart and Rickards won a competition to design both a town hall and courts as the first two structures in a spacious enclave of public buildings in the centre of Cardiff. Each of the two buildings opened in 1906, though the proposed town hall actually opened as the City Hall after Cardiff won its city status in 1905, and each is now Grade I listed. Incidentally, the competition was judged by Alfred Waterhouse, architect of the Natural History Museum in London but also of the doomed Hove Town Hall (that burnt down in 1966) and the ruined Metropole Hotel in Brighton (that has been vandalised almost continually since 1959). Cathays Park consists of two principal avenues with various inter-connecting roads and paths that surround a central grassed area which is home to the Welsh National War Memorial. The fifteen or so huge Portland stone institutions that line the avenues are of similar heights but different, yet complementing, styles which include Edwardian Baroque, Neoclassicism, Art Deco and Brutalism. Whilst it is the concept of the composition that fascinates most, for Brighton & Hove has no equivalent civic centre after all, I was taken by one of the buildings in particular. The obvious favourite is Cardiff City Hall for its grandeur and, indeed, its distinctive clock tower. 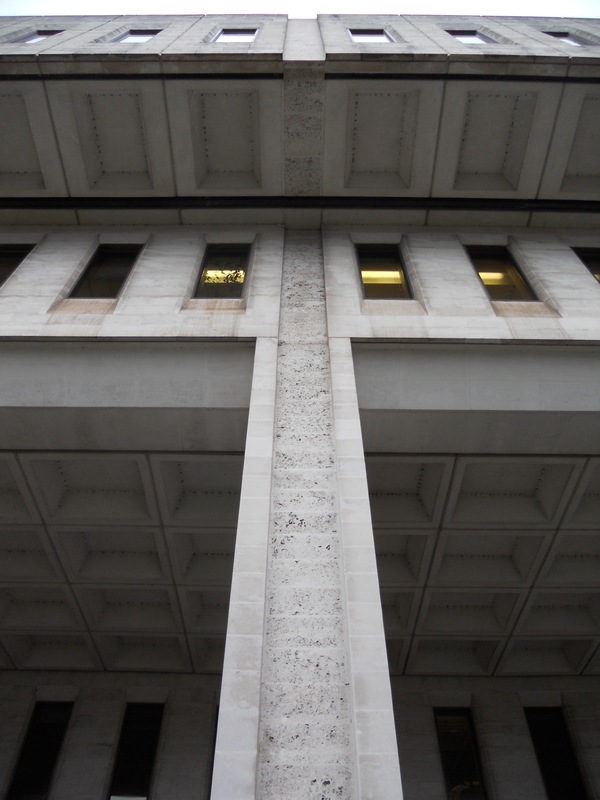 But I was more drawn to the Art Deco lines of the first of the two Crown Buildings on the site. 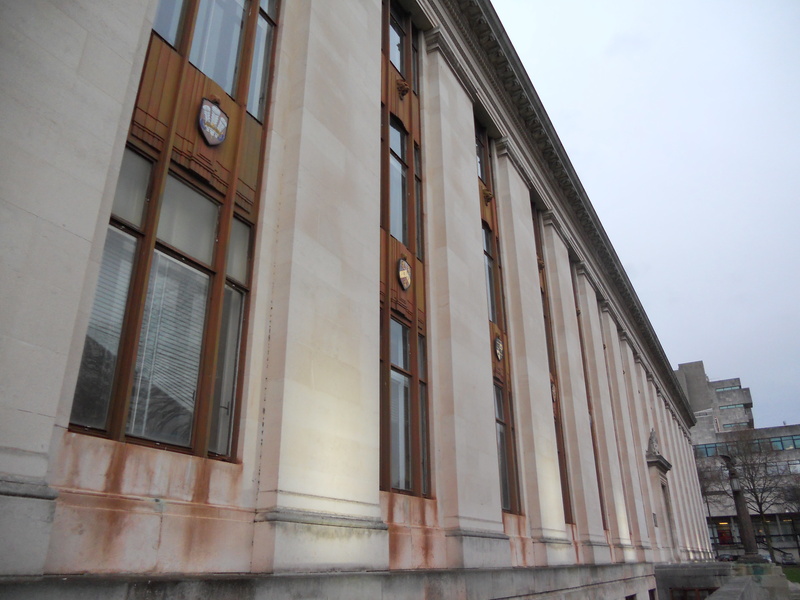 One building of interest is the attractive University of Wales Registry which bears a striking resemblance to Hove Library. A Cathays Library exists but it is not actually situated within Cathays Park. It is nearby though and was, like Hove’s, a gift from the library benefactor Andrew Carnegie.